Drive one of those cage things and wonder why people are crazy enough to ride a motorcycle? Ride a motorcycle to work today and dreading having to put on your gear to fight traffic home on your commute? 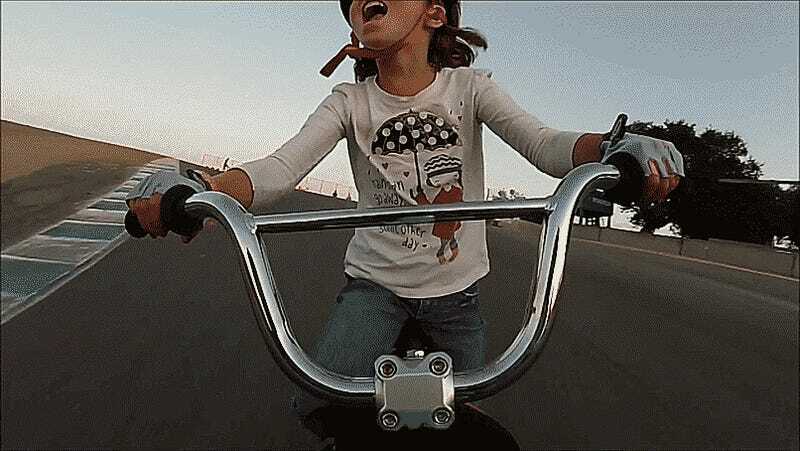 This little girl reminds us all why we ride. This video has been making its way around the interwebs this week after Matt Woodworth posted a video of his daughter Juliette riding her bicycle down the famous Corkscrew at Mazda Raceway Laguna Seca to his Facebook page. The track’s official page shared and the rest is history. More importantly, the look on Juliette’s face is the same as the look on mine the first time I rode a motorcycle. I’ve made the same little squeal followed by taking my hands off the bars at the end of a great road on a perfect evening, just as she does at 0:31. So, if you’ve never ridden and wonder why we risk it, or you ride but have forgotten why - just ask Juliette.